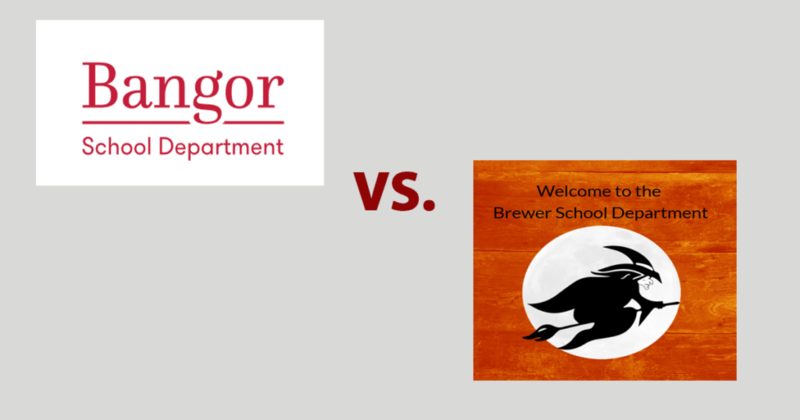 Bangor and Brewer School Department logos courtesy of their respective websites. BANGOR – What if the great Maine public school athletic rivalries were applied to academics and public education spending? That’s what Maine Examiner will attempt to do with this first “Showdown” piece. By comparing recently released MEA test results in three areas and per-student operating cost, we will see which public school system wins in the public school rivalry. Bangor and Brewer represent a classic Maine rivalry that goes back a century. The former has been called the “Queen City” since the mid-1800’s with Brewer known as the Sister City to Bangor. According to public spending data available from the Maine Department of Education, Bangor spends $10,645 per-student in operating costs for the 3,645 students in the Bangor Public Schools district. Across the river, Brewer spends $9,486, or $1,159 less per-student than Bangor for the 1,417 students in the Brewer Public Schools district. In the arena of academics, at least in the results of standardized state testing, Bangor has the upper hand. According to the 2017-18 MEA test results, 66% of Bangor students tested at or above state expectations in English/Language Arts/Literacy, while only 52% of Brewer students reached that mark. A full 14 percentage point advantage to Bangor Public Schools. In mathematics testing, Bangor once again comes out on top, with 56% of Bangor students at or above state expectations on MEA mathematics testing. Brewer comes in at just 38% of students reaching or exceeding state expectations in mathematics, falling 18 percentage points short of Bangor students. The match-up is tight in science testing, with Brewer squeaking out less than a 1 percentage point advantage over Bangor, with 68% of Brewer students at or above state expectations in science while Bangor students tested at 67%. If you’re inclined to believe that additional spending in education pays off with better results, you can probably point to the additional investment by Bangor in their students resulting in stronger outcomes in the mathematics and English test results, but the science scores would suggest that Brewer’s success with one of the lower overall per-student costs in the state is at least worth investigating as a data point that disproves the belief that more money equals better results. For this showdown, however, Bangor gets the edge for dominance in two of the three measurable data points, while keeping per-pupil costs well below what most area school districts spend.